Steve Weingart and Renee Jones are a musical duo, a married duo and one half of Steve Lukather's band. I sat down up close with a chance to talk to both of them their new album "Obeservatory", music and muisicians. As soon as I pulled into the Verizon Amphitheatre in Irvine, Ca. for the Jack FM 7th Birthday Party Show I knew it was going to be a great day. It was scorching hot as soon as I got out of my car. But the first sound I heard was the Toto song "99" emanating from the speakers of a "party tent' directly adjacent to me. Next up was "Africa" so those Toto fans were gearing up for the days festivities. The lineup for this years show was Dale Bozzio's Missing Persons, Gin Blossoms, MC Hammer, Toto, Pat Benatar/Neil Giraldo and Joe Walsh. It was a triumphant return for Toto in America at a show fairly close to home. Other than a one off show in Denver earlier in the year this was the first show in the States in years. It was a sold out Chumash Casino Show in Santa Ynez, California. Todd Rundgren was extremely prophetic when he told me in Nashville two weeks ago that this Greek Theatre, Los Angeles Ringo All-Starr Tour ending show would be bittersweet. 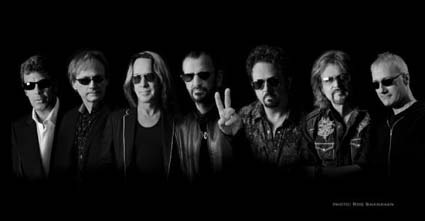 It was a historic day for the Ringo Starr All Starr Band for Ringo's 72nd birthday, on July 7th 2012. The show was played at a Historical Landmark, the Ryman Auditorium in Nashville, Tennessee and was going to be filmed for a DVD. Reggie Boyle spent a day in CJ Vanston's Los Angeles area Treehouse Studio with CJ, Steve Lukather, John Pierce and Kristina Helene. This day was spent working on the bass parts for Steve's record Transition. Reggie Boyle talked with Steve Lukather about joining the Ringo Starr's All Star Band this summer in the USA. In celebration of their new project Steve Weingart (keyboards) and Renee Jones (bass), both members of Steve Lukather's band, played a Show at the Baked Potato in North Hollywood, California on March 3rd 2012. This gig showcased their new CD 'Dialogue'. Rounding out the ensemble were Simon Phillips (Toto, The Who, Jeff Beck) on drums, Mike Miller (Chick Corea, Bette Midler, Gino Vanelli) on guitar and Katisse Buckingham on saxophone and flute. How was 2011, what will happen in 2012? At the end of a moving year Reggie Boyle summarized 2011 with Steve Lukather and had Lukather looking forward to 2012.